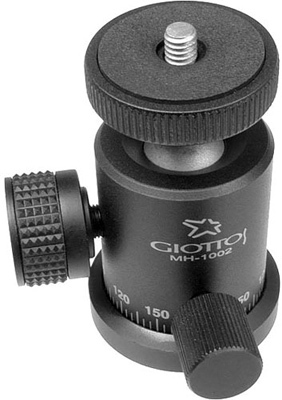 The Giottos MH-1002 Mini Ballhead is a solidly-built but very small tripod head that screws into the bottom of a DSLR (there is no quick release). This is a good travel-friendly head for small tripods and lightweight cameras. • This ball head is not recommended for use with lenses 100mm or above.